The Chronic Rift – My Very First Podcast! The fine folks at The Chronic Rift Network: Finding the Culture in Pop Culture were kind enough to interview me about my book, Tortellini. 😀 It was my very first time ever doing a podcast. I knew what a podcast was (sort of) but I’d never listened to one, so I had no idea what to expect. I knew there was a section for podcasts on my ipod, but I never had used it before. I spent most of the day nervous, because of my insane fear of public speaking. But when we actually did it, I found I really enjoyed the experience. Speaking in front of an audience isn’t so nerve-wracking if you can’t see the audience. Maybe I should have put a blindfold over my eyes for all my book reports and speeches when I was growing up. At any rate, without any further ado, here it is for your enjoyment! 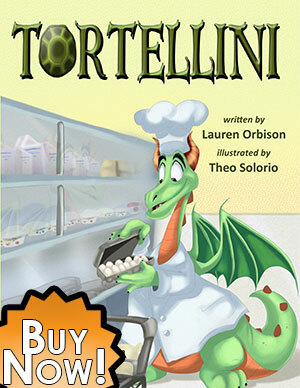 Tortellini was originally intended to be just a couple of blog posts. Writers are told over and over again to blog. Because blogs sell books. The more you post, the more people you reach. But a lot of writers write about writing. And I didn’t want to give the same advice that everyone else was giving. So what else could I write about? 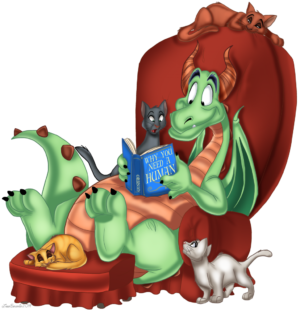 The intent behind the story was a dragon anthology of flash fiction and dragon names going from A-Z. We called these “drabbles” if they were 100 words or less in the fanfiction world. I thought Dragon Drabbles was an adorable name for a blog. I had just finished reading Artemis Fowl by Eoin Colfer, and Alphonse was a code name Artemis used in book 4. Alphonse started with A, and it seemed right for this particular dragon character. Once I got started writing, Alphonse didn’t stop at the word count I intended. He kept on going. And going. He turned into a short story. I never made it to write the rest of my anthology. I submitted a much shorter version of the story to a couple of contests before we realized it really needed to be longer, not shorter. My writing mentor Holly Lisle held a contest to showcase student work with her anthology How to Think Sideways class. The theme of the contest was “creation.” The word count had to be 2500 words or under. 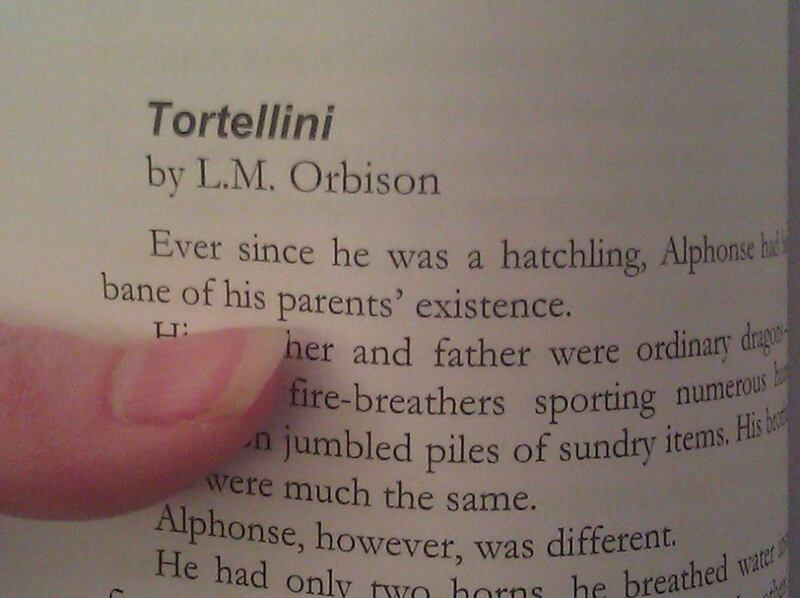 Tortellini expanded right at the maximum word count allowed. The competition was intense. There were a lot of entries. And there was only room for 33 stories. I didn’t win in the top 3 for the cash prizes, but I got a spot. The feedback from the judges was fantastic. The story was good but the stakes needed to be higher. In this particular part of the story, Alphonse had no consequence if he failed. I agreed with their feedback. After some discussion, my husband was the one who suggested the consequence for failure. I made the edits as requested and resubmitted. The short story made it into print into her anthology The Adventure of Creation. I loved seeing my name in print on something I’d created that I was proud of. I wanted more. I wanted my name on the front. Not just inside. Once the rights reverted back to me, I could do what I wished with it. My mother loved the story. Now normally, as an independent author, that’s not a good thing to mention, because parents usually love everything their children write. “Good job, sweetie, I’m so proud of you!” is a typical reaction. My mother isn’t like that. She is a National Board Certified 4th grade teacher. For those of you who don’t know what National Board Certification is, it is a very elite degree that not many teachers have. It means she’s qualified to teach in any state in the nation. She loved Tortellini in short story form so much she begged for it in picture book format so she could read it aloud to her class. She talked about it at conferences she went to and got other teachers interested. And kept asking. And asking. For years. 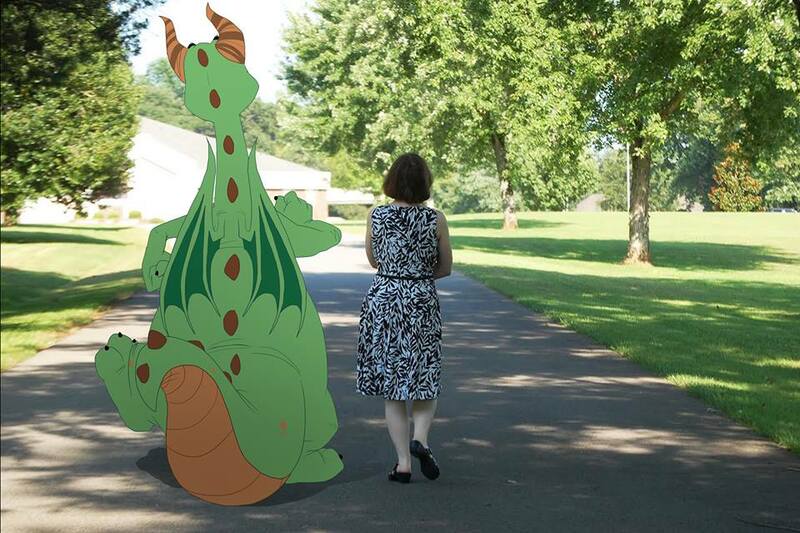 I agreed with her that it would make a great picture book. It only took one line of editing to make it suitable for children rather than adults. But, I thought the only way to get my book published in picture book format was to keep querying agents and publishers. I was already neck deep in the query process for other manuscripts. One was called, The Fart Heard ‘Round the World. It garnered interest from Penguin Young Readers Group. They requested edits. The other was another picture book called, Why You Need A Troll that Random House expressed interest in. They also requested edits. However, the edit suggestions completely changed the storyline. I declined their request for edits with a polite letter explaining my reasons. The editor respected my decision and even offered encouragement. We parted on good terms. When I started getting interest from major players in the publishing world about other manuscripts, I went to my mentor, Holly Lisle, for advice. We talked about it awhile and I queried even more. But querying felt an awful lot like I was a hamster spinning my wheels. Who knew how long this process could take? I needed to be writing. These weren’t easy letters. It was a drain on my health, too. Sometimes crafting one letter took an entire day or more, depending on the agent I had in mind. And then after that, it took a little bit to recover from the intensity of the pressure involved. I had always wanted to be published by the folks in New York, but then I got to thinking about the fact that once I gave the manuscript over to them, I would have no control what happened to it afterwards. Now, that doesn’t bother me so much with regular print material. But for picture books? After the edit requests, I didn’t like the idea as much. I would have no input in choosing the illustrator. I would not get to approve the illustrations. And I would be expected to market it anyway even if I hated how it turned out. Not to mention the sheer amount of time involved. I didn’t have the patience to wait another two years to put out my first book. Who knew what my health could be like by then? I couldn’t afford to wait another two years. I went back to Holly Lisle for advice. Holly encouraged me to go independent. She had broken away from her publishers. I could start independent and in theory be picked up by a commercial publisher later down the line, if that’s what I really wanted. My Financial Administrator * and I looked at our finances and talked it over. We had some funds in our savings so I started looking around at illustrators. But most illustrators were way out of our budget range. There was an awesome illustrator I wanted to hire, Theo Nicole Lorenz. I am a huge fan of her coloring books Unicorns Are Jerks and Fat Ladies in Space. (If you haven’t heard of her, you should check her out. https://nicolelorenz.com/ ) Her rates were too expensive for me to afford on our meager budget and she was swamped with other work until September. She did give me a tip on how she found her first client, though. She told me someone had emailed her art professor and asked if students needed summer work and suggested that I explain my budget situation and that that’s what I should do. My first thought was Florida colleges because of the connection to Disney. I thought that there might be students who needed work. But then that led me to thinking about FC, Florida College. And then from there I thought of Freed-Hardeman University where I attended for several years. There was a professor in the Mathematics department, Lana Pirtle who worked there that I’d known a very long time. They used to be our neighbors and we baby-sat their kids every summer for eons. I looked in the art department and saw the lengthy list of art professors but didn’t have any idea who I should contact. She pointed me in the direction of Dr. Barbara England. Dr. England fell in love with my manuscript, Why You Need A Troll and immediately wanted to do it herself rather than pass it along. She had always wanted to illustrate a children’s book but had never had a manuscript to work with that she liked. But Tortellini was longer and would require more illustrations and she was teaching at the same time. She had said she would illustrate that one if I couldn’t find anyone, but it was more than she could do at the time. So it was back to the proverbial drawing board for Tortellini. However, I’m not one to give up easily. 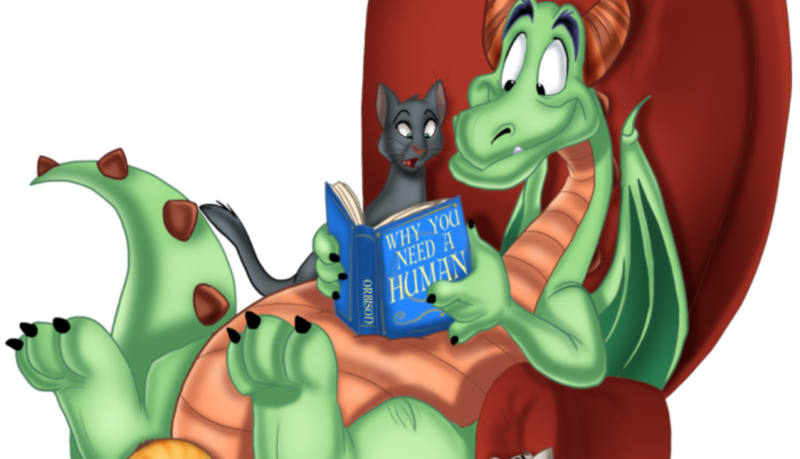 I looked around deviantArt. I started browsing in the Fan Art section. I had commissioned an artist there several years ago to draw a dragon for me and she did such a good job, it’s framed on my wall. I asked her to do it, and she really wanted to, but she was so swamped with other work that she had to turn me down. I commissioned another artist, but things just didn’t work out the way I had hoped. I had to turn her down. If you’ve ever been on the receiving end of rejections, it’s not easy to give them to other people. It was tough to do. But it needed doing. Right after this, I found dwarfdraco. 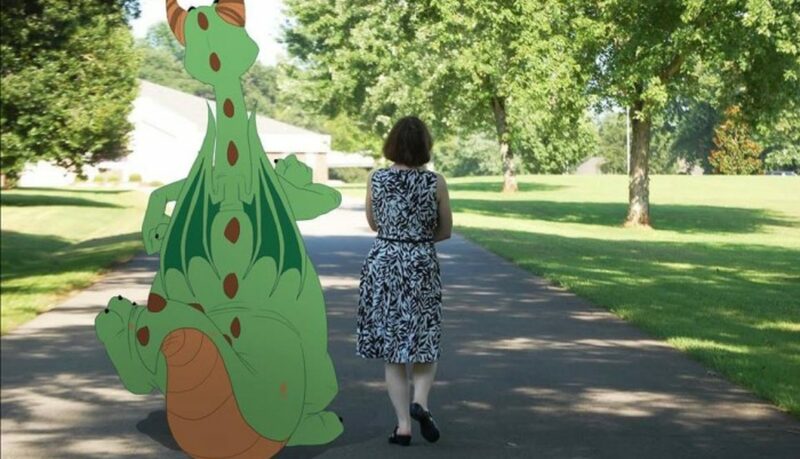 ( https://dwarfdraco.deviantart.com/ ) She had some Disney related fan art that was so close to the real thing I couldn’t tell the difference and I grew up on Disney. I watched The Little Mermaid everyday for 6 weeks straight after my open-heart surgery when I was 8. I began looking around at her other work. 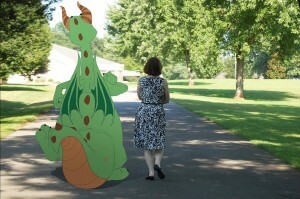 And I found some great dragons she’d done. I loved them all. And she was open for commissions at very reasonable rates. I was so excited; I messaged her right away. We began e-mailing about this character and discussing my project. She showed us her process on Youtube and my husband’s a hard guy to impress, but even he was impressed with her skill. So she did a mock-up sample and I just loved him. Once I saw the version she illustrated, I couldn’t imagine him any other way. I also learned, funnily enough, her name was also Theo. I learned how young she was (16 at the time) and when I did, I immediately wanted to make sure I talked to her parents about this project too, and make sure they were okay with the project. We all signed our contract. When I knew that we were serious about going independent, contracts in place, I sought the advice of an accountant who told me to set up a DBA account for everything writing related. DBA stands for Doing Business As. I had to think of a business name so Orby Books was born. The name Orby comes from my father. He has a private pilot’s license and it’s a family joke that his plane is called Orbison Airlines or Orby Air for short. Orby Books was a natural choice. So we set it up. Then we got down to the nitty-gritty of making the book actually work. Theo had never done a storyboard for a picture book before, so my husband did some rough sketches and sent them to her so she could get the ideas. Once she got them, she sent HER storyboard back. And it was hysterical! We loved it! So we got to work. Tim was able to help her with direction in what the story needed. She got all 26 illustrations done in less than a month. Tim did the interior layout. He picked the font and arranged the images on the pages. He also did the covers with Theo’s images. He did the copy editing. It’s a running joke in our house that I’m the CEO/President/Writer/Product Developer and he’s the Vice President, Art Director, Financial Administrator (I’m terrible at math)* , Editor, Copy Editor, and Book Designer. I showed the final product to Holly Lisle who loved it so much she gave me a blurb to use on the back as a testimonial as to the quality of my work. After this we ran it by a professional copy editor, Silver Jay, who said there were only two mistakes in the entire document. We submitted our manuscript to CreateSpace on Amazon.com. It took about a week or less for us to get our proof copy. We made a scant few changes, most in the Author’s Note section and then re-submitted. It was online live in 24 hours. At this point we were scrambling. I knew you needed to have a website and fan page and all of that set up before you went live, but due to some unforeseen circumstances, things didn’t go quite as smoothly as we hoped, to say the least. But now everything’s in place. 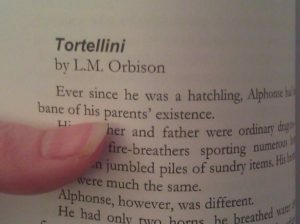 That’s how Tortellini came to be a book that I hold dear to my heart. It was a team effort. I couldn’t have done it without Theo. I couldn’t have done it without Tim. And I couldn’t have done it had I not had written the story in the first place. The entire process from blog post to finished book took about four years. I got the idea for the story because I can’t cook at all myself. Everything I know about cooking comes from watching Good Eats. I watched a lot of cooking shows. I watched Everyday Italian with Giada DeLaurentis, and I also watched Rachael Ray’s 30 Minute Meals. I loved their shows, but their shows were mainly about recipes. Alton Brown was the one who explained to me how cooking worked to where I could understand it. Which is why he got a cameo nod in the book. 🙂 Weird AL got a nod even though he’s a vegan because I loved his Food Album when I was a kid and grew up listening to it with my Mom on car trips. To this day I still love his music. 🙂 White and Nerdy is one of my favorite songs. It was a lot of fun pretending I could cook as a dragon.